The current salvage operation aims to recover some 2,000 articles and will continue until Feb. 3. During the first stage in 2008 some 1,171 pieces, such as sword hilts, uniform buttons and rifle bullets, were salvaged. The sailing frigate Ertuğrul, launched by the Ottoman Navy in 1863, departed Istanbul on July 14, 1889 to show the Turkish flag in Asian waters. It was under the command of commander Ali Osman Pasha, who was empowered to represent the Sultan, and a crew of 609 men. The decision to send the ship was partly as a response to the October 1887 visit of Prince Komatsu Akihito ( 1846–1903) to Istanbul, and partly to advance the pan-Islamist foreign policy of Sultan Abdülhamid II (1842–1918)1. In spite of the problems, the Ertuğrul did manage to arrive in Yokohoma in one piece on June 7, 1890. Over the next three months Ali Osman Pasha and his crew had a series of very successful meetings with the imperial family and the Japanese authorities. Ali Osman Pasha, Skipper Ali Bey and several other Turkish navy officers were even decorated with Japanese medals. The problems did not completely fade away, though. During its stay, no less than twelve crew members died of disease. On September 15, Ertuğrul embarked on its long journey back to Istanbul. The next day, weather conditions however started to quickly deteriorate and the ship soon found itself battling a typhoon. One of the masts collapsed, water broke through into the coal depots and the ship set course for Kobe, the nearest safe harbor. The crew battled the storm valiantly, but it was all for naught. 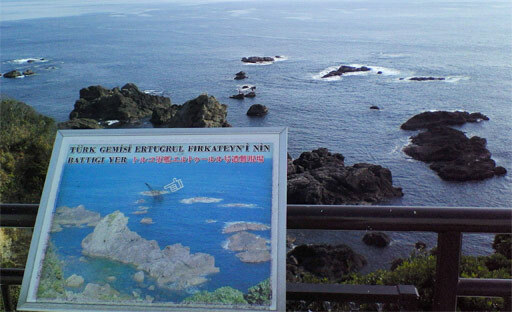 Around midnight on September 18, the Ertuğrul hit the sharp rocks on the coast of Oshima Island. Only sixty-three sailors and six officers managed to save themselves. Some 533 crew members, including Ali Osman Pasha, lost their lives. The survivors, nine of them seriously wounded and most of them virtually naked and covered with blood, staggered into the Oshima lighthouse, where the keeper immediately realized that they were survivors from a shipwreck. Communication was impossible, but by pointing at the Turkish flag in the lighthouse signal book, the crew was able to convey their nationality. Oshima was still a very isolated place at the end of the 19th century, with no modern communications. So it was impossible for the lighthouse keeper to contact authorities in Tokyo. Instead he ran through the typhoon’s lashing wind and rain to alert local police, doctors and school teachers. Within hours, island residents started to arrive with clothing and food. As the dawn started to throw light on the island’s beaches and surrounding sea, the scale of the disaster started to unfold before the villagers’ eyes. Dead bodies were found everywhere. Over the following days, the survivors were taken to Kobe by two Japanese and five German ships. The Japanese corvettes Kongō and Hiei, leaving Tokyo in October, eventually transported them back to Istanbul, where they arrived on January 2, 1891. 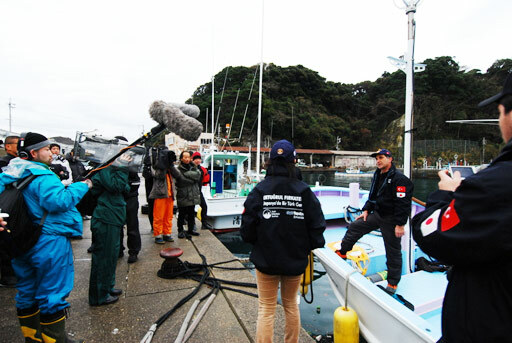 The following month, a cemetery was created at Oshima for the crew members that perished in the accident. Next to the lighthouse, a memorial was built. In 1974, a museum was added as well. The tragedy was widely reported in the Japanese press and deeply moved the Japanese nation. It persuaded a young man by the name of Torajiro Yamada (山田寅次郎, 1866-1957) to start a donation drive for the families of the deceased. With the support of the Japanese press, Yamada managed to collect the unexpectedly large sum of 5,000 Yen (some 100 million yen in today’s value). Yamada decided to travel to Turkey and on April 4, 1892 he personally handed the sum to the Turkish Minister of Foreign Affairs Said Pasa. A few days after this meeting, Yamada met with Sultan Abdülhamid II who requested him to remain in Turkey and teach Japanese to military cadets. Yamada eventually remained in Turkey until the onset of WWI in 1914. During his twenty years in the country, he became the sole agent for trade between the two countries, a partner in the first Japanese souvenir shop in Turkey, worked as an interpreter, arranged meetings between visiting Japanese and Turkish government officials and basically served as an honorary consul. Although he is virtually forgotten in Japan, he is still widely known and respected in Turkey, where he is seen as the founding father of the friendly relations between the two countries. The actions of the villagers, the Japanese government and people, and the role that Yamada played, have left such an indelible impression on the Turkish people that in 1985, during the Iran-Iraq war, the country airlifted 216 Japanese nationals to safety. A very tragic event was hereby transformed into a long-lasting friendship between two nations. 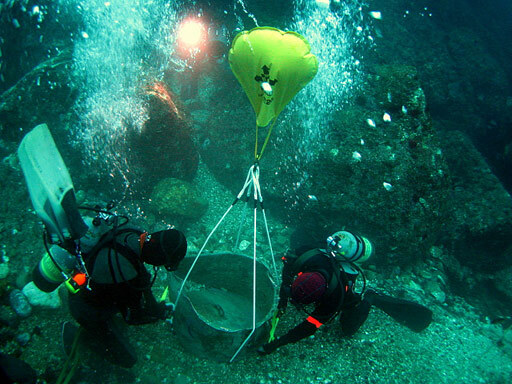 For inquiries about the salvage mission, please contact the General Management Division of the Municipality of Kushimoto. Phone: 0735-62-0555. 1 Edström, Bert (2000). The Japanese and Europe: Images and Perceptions. Routledge, 107-108. ISBN 1873410867. 2 Wikipedia, Ertuğrul (Ottoman frigate). Retrieved on 2009-01-30. 3 Edström, Bert (2000). The Japanese and Europe: Images and Perceptions. Routledge, 109. ISBN 1873410867. 5 Wikipedia, Islam in Japan. Retrieved on 2009-01-30. 6 For more information about the relationship between Japan and Turkey visit Relations between Turkey & Japan in History.